Delaware County is a county in the state of Ohio, United States, within the Columbus, Ohio Metropolitan Statistical Area. According to the 2010 census, it has a population of 174,214, which is an increase of 58.4% from 109,989 in 2000, making it the fastest growing county in Ohio. Its county seat is the city of Delaware, and both are named after the Delaware (Lenape) tribe. According to Forbes Magazine, Delaware County is the fifth best place in the United States to raise a family and the second best in Ohio, behind Geauga County. It was home to former U.S. President Rutherford B. Hayes. According to the 2010 census, the county has a total area of 457.33 square miles (1,184.5 km2), of which 443.10 square miles (1,147.6 km2) (or 96.89%) is land and 14.23 square miles (36.9 km2) (or 3.11%) is water. In the county the population was spread out with 28.20% under the age of 18, 7.60% from 18 to 24, 32.60% from 25 to 44, 23.30% from 45 to 64, and 8.20% who were 65 years of age or older. The median age was 35 years. For every 100 females there were 98.00 males. For every 100 females age 18 and over, there were 94.90 males. 1 Mainly in Franklin County, but parts of Columbus extend into both Delaware County and Fairfield County. 2 Mainly in Franklin County, but parts of Dublin extend into both Delaware County and Union County. 3 Mainly in Franklin County, but a part of Westerville extends into Delaware County. Interstate 71 and U.S. Highway 23 pass through the county. Interstate 71 crosses over Alum Creek immediately south of the Alum Creek Lake recreation area. The area is served by the Delaware Municipal Airport, which is strategically located to serve the rapidly developing southern Delaware County area and the north portion of the Franklin County and Columbus, Ohio, areas. The airport contains a 5,000 foot runway, flight terminal, lounges, and weather briefing areas. It is home to approximately 80 aircraft and an estimated 40,000 operations take place per year. Several smaller airports are located in the county. Additional local print publications include the Delaware News, which is owned by Columbus-based Suburban News Publications, ThisWeek in Delaware, which is owned by the Columbus Dispatch, and the Transcript, the student paper at Ohio Wesleyan University. Local residents often subscribe to out-of-town papers as well; the Columbus Dispatch is popular among many. Notable natives include Rutherford B. Hayes, who was the 19th President of the United States (1877–1881). His wife, Lucy Webb Hayes, was one of the most popular of first ladies. She strongly supported the Temperance movement, and no alcohol was served in the White House during the Hayes administration. This prompting the press to call her "Lemonade Lucy." She also introduced the Children's Easter egg roll, egg rolling, on the White House lawn. William Rosecrans, a Major General during the American Civil War commanding the Army of the Cumberland from 24 October 1862 to 19 October 1863. 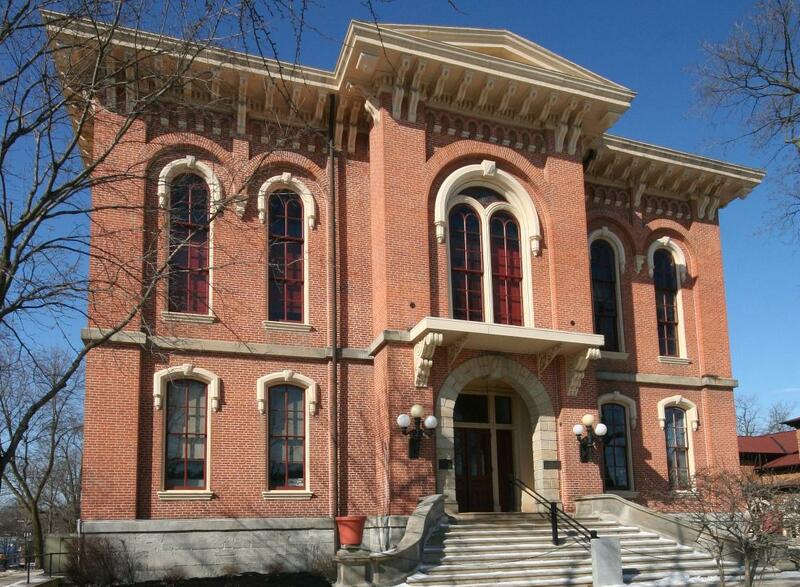 ^ "Ohio County Profiles: Delaware County" (PDF). Ohio Department of Development. http://www.odod.state.oh.us/research/FILES/S0/Delaware.pdf. Retrieved 2007-04-28. ^ "Delaware County data (population)". Ohio State University Extension Data Center. http://www.osuedc.org/profiles/population/places.php?sid=41&fips=39041. Retrieved 2007-05-10. ^ "Delaware County QuickFacts". United States Census Bureau. http://quickfacts.census.gov/qfd/states/39/39041.html. Retrieved 2012-02-16. ^ "Delaware County data". Ohio State University Extension Data Center. http://www.osuedc.org/profiles/profile_entrance.php?fips=39041&sid=0. Retrieved 2007-04-28. ^ "America's Best Places To Raise A Family". Forbes. June 30, 2008. http://www.forbes.com/home/2008/06/27/schools-places-family-forbeslife-cz_zg_0630realestate.html. ^ a b "Alum Creek State Park". Archived from the original on 2007-08-23. http://web.archive.org/web/20070823121933/http://www.dnr.state.oh.us/parks/parks/alum.htm. Retrieved 2007-09-12. ^ a b "Delaware State Park". http://www.dnr.state.oh.us/PARKS/parks/delaware.htm. Retrieved 2007-09-12. ^ a b "Delaware Airport". Archived from the original on 2007-08-26. http://web.archive.org/web/20070826155611/http://www.delawareohio.net/departments/airport. Retrieved 2007-09-12. ^ "End of the Road for Germain Amphitheater?". http://www.dispatch.com/live/content/local_news/stories/2007/09/16/1_GERMAIN_KEITH.ART_ART_09-16-07_A1_0P7TPJ2.html. Retrieved 2008-05-19. ^ "Library of Congress Online Catalog". http://catalog.loc.gov/cgi-bin/Pwebrecon.cgi?v3=1&DB=local&CMD=010a+2007001849&CNT=10+records+per+page. Retrieved 2007-09-12. This page uses content from the English language Wikipedia. The original content was at Delaware County, Ohio. The list of authors can be seen in the page history. As with this Familypedia wiki, the content of Wikipedia is available under the Creative Commons License.